So, I bought these bags along with the shoes which *thanks the Almighty* didn't turn up disappointing at all! I really love the versatile collection at Limeroad.com and will surely shop from them in future but one things for sure! I am NEVER buying shoes online!....and even if do, I'll shop only for flats, and wedges! The order arrived by airmail. There were no damages. I bought two bags- One for Mum and one for me. I had ordered this bag in maroon colour(as that's what it showed on their website) but they sent me red colour. No offence here as I think red looks more gorgeous! Like 'em? I am loving them! The above one is mine, the other one's Mum's! Yeah, I remember that Bushra! And even the one above has mentioned me that (winks at Rat). But, due to my very less time now, I could not though will save this one for future . The bag looks so lovely and that's so nice of you getting one for your Mum :) ...have a great time together with those cute bags !! [ Smiles ] Once you are comfortable shopping online, you are going to have a great time; pus it saves you the hassle. love the bags! following u now! Ru on bloglovin? Totally love the bags bush! The truly look gorgeous. 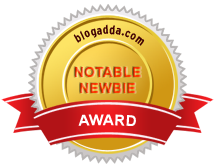 have you you added you blog on my link your blog section ?? I love shopping online. My favorite are Myntra and Voonik. While its good that Voonik shows me only the stylist-handpicked stuff that suits me, it lacks the social lookbook feature. Their android app is much more interesting than the website though. It's My first Blogoversary - YAY! Ambi Pur Roomfreshner- A life saver!